The 1936 Buffalo Special pumper fire truck made its parade debut after being restored over the winter by Plympton Fire Department Lt. Don Vautrinot and Mike Watts of the Weymouth FD. Photo by Deborah Anderson. 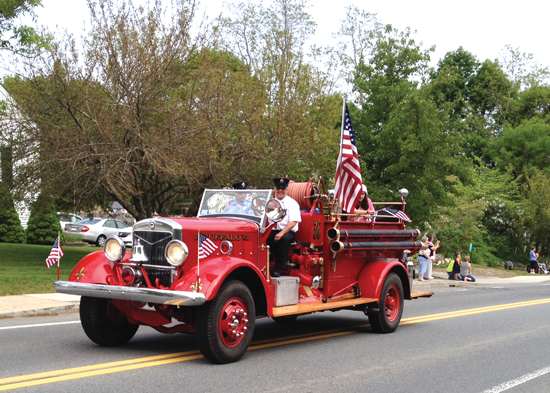 Plympton – The parade, which formed by the Historical Society at the corner of Center Street, had two new notables this year – the Silver Lake Marching Band, who had been absent from the small town for at least a decade, marched and played to the applause of those lining the parade route, and the newly restored 1936 Buffalo Custom fire truck. Driven by Plympton’s own Lt. Don Vautrinot, with Mike Walsh of the Weymouth Fire Department, the two painstakingly restored this beauty over the winter, showing what the generosity of firefighters throughout the state, and many corporate sponsors, can do when a couple of guys who like trucks get together with a project. The beautiful result will be encouraged to return to many more Memorial Day parades for years to come. Selectmen, Mark Russo, Colleen Thompson, and newly elected Christine Joy, led the parade and parade marshal this year was the Freitas family, Jackie Freitas, wife of the late Joe Freitas, the longest serving selectmen in the Commonwealth with 36 years of service. Scouts, Girl Scouts, Boy Scouts, and Daisies, marched the mile long route to the green, and antique cars, led the Fire Department’s full array of rolling stock. Plympton Police Department’s motorcycle officer Steve Teri and Police Chief Pat Dillon were notables. At the Gazebo on the Green, Selectman Christine Joy welcomed the group. Selectman Mark Russo led the group in a moment of silence. Selectman Colleen Thompson led the Pledge of Allegiance. Rev. Anna “Nan” Eaton Butera gave the invocation. Dennett School student Geoffrey Cook brought many to tears with his recital of his essay “What Memorial Day Means to Me.” Rick Ducharme read “Flanders Fields” and Natalie Bohmbach recited the Gettysburg Address. Audible gasps were heard when Sydney Adams began her a cappella solo of the Star Spangled Banner on a high note, but she handled a key change like a pro, and finished her song with the same enthusiasm with which she began. The audience rewarded her with resounding applause. Chief Petty Officer USNR (Retired) Steve Lyons read the Fallen Soldiers List and Sgt. First Class US Army (Retired) Steve Lewis read a list of some of Plympton’s present residents who have served. Betsy and Wesley Kupic played TAPS. Wreaths were placed at the Gazebo by Boy Scouts Andrew Adams, Wesley Kupic and Frank Perfetio. The Honor Guard then proceeded to the First Congregational Church Cemetery to honor deceased Veterans and Fallen Heroes. Thanks go to the 2015 Memorial Day Committee members Kim Adams, Tricia Detterman, Peter Kupic, Kristen LeVangie, Steve Lewis, Steve Lyons, Chris and Lorna Rankin, and Tim Snow, who co-ordinated all the details, along with the many volunteers who helped on Memorial Day. Special thanks to Plympton’s veterans’ agent Roxanne Whitbeck.